No matter the occasion, food is often at the forefront of many gatherings and celebrations, particularly around the holidays. While dealing with picky eaters is something many families might be used to, accommodating children or teens on special diets can pose some unique difficulties on these occasions. A 2016 Mott Poll asked parents about their experiences with teens trying gluten-free, vegan, vegetarian, and/or paleo diets. One in six parents said their teen had tried one of these diets. Half of parents reported that the teen’s diet caused conflict and holidays and family gatherings. 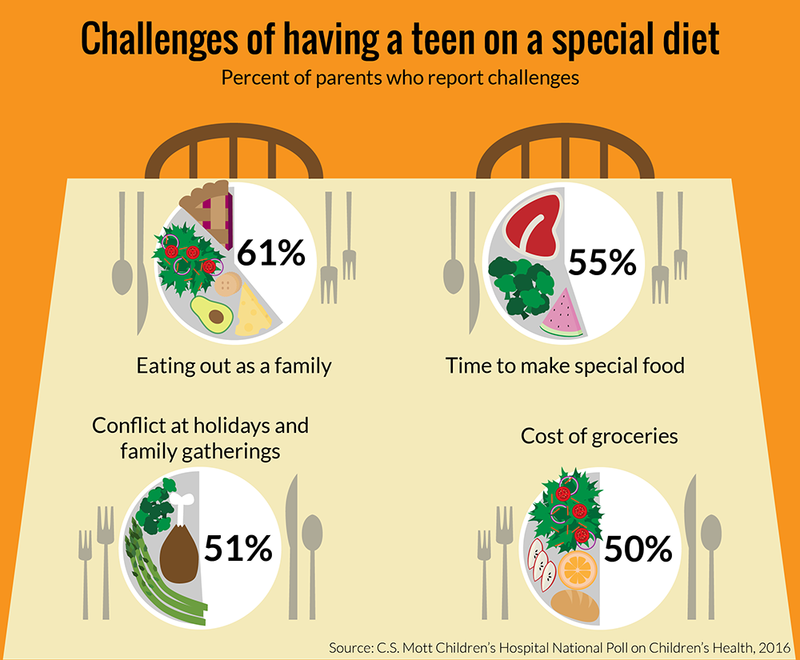 Only 17% of parents brought their teen to a health care provider to ask if the diet was healthy. Teen experimentation with these special diets is common. While frustrations may arise from accommodating these diets around the holidays, parents might look for opportunities to compromise, such as having the teen prepare their own meals or agreeing to deviate from the diet during the holidays. Parents who are concerned about the effects a particular diet may have on their teen should consult a health professional.